What makes a successful recruitment agency? To answer the question, one has to look backward, at the relatively recent shakeup felt keenly by third party recruitment agencies that were at the height of the technology boom market, very successful. Note: a special thank you to this month’s Leadership Sponsor, Linium Staffing. Transform and innovate your business with Linium’s strategic staffing solutions. Still smarting from 2007-08 lows, many analysts assumed that high fee third party recruiting agencies were done for, when in fact, the economy not only saw the rise of recruitment process outsourcing but staffing agencies. Last in line, were the independent recruiting agencies; slashing fees and incorporating as much automation as possible into a cycle that had seen few improvements since the advent of the job board. Today, the U.S. job market is recovering as unemployment rates decrease, bringing an increased need for businesses to incorporate recruitment agencies into their hiring strategies. Recruitment agencies, against all odds, are a growing industry that service 40% of employees entering the job market. Many point to the high costs of turnover and the increasing competition for so-called “purple squirrels”. Surveys report averages of $7,000 to replace a salaried employee, $10,000 to replace a mid-level employee, and $40,000 to replace a senior executive. With those costs nowhere near the fees recruiters used to command, many are out of the range of corporate recruiting teams, who also found their department staff dwindle during the late aughts, it’s little wonder that 90% of U.S. companies have turned to recruitment agencies to ensure the process runs efficiently and effectively. Far from extinct, Bersin by Deloitte found that U.S. companies are spending around $72 billion in recruitment agency services and likely three times that globally. Recruitment agency services are a booming business and as in any industry vertical there are specific factors that influence agency success. 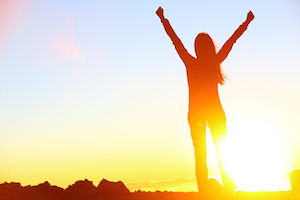 What does a successful recruiting agency look like? Inavero’s 2014 Best of Staffing awards feature over 100 of the best recruitment and staffing agencies across the nation based on two key elements of a successful recruiting agency: client services and candidate experience. Just as corporate recruiters complain of feeling caught between the hiring manager, the Human Resources department and the slew of candidates; the agency recruiter finds herself working to please both the client and any candidates who come across “her desk”. While many RPOs have advocated the shift from working a “full desk” (full desk in this context refers to finding the client, signing the client, securing the requirement, finding the candidates, arranging the interviews and placing the final candidate with the client, who may or many not be agency loyal), there are still many agencies in the United States and the U.K. that work in this manner. So a successful agency must be able to provide quality client services and promote an exceptional candidate experience, serving as a partial job coach in many instances, providing additional services like resume critique review, interview preparation, and coaching. On the client side, there are additional factors for which the agency must be explicitly aware; social job postings for example make it very difficult to prove where the source of hire comes from in some cases. To combat this, the aforementioned candidate experience becomes even more crucial, as do iron-clad agreements with candidates AND clients. Successful agencies also have specializations in specific candidates skill sets or in specific industries. Again, like sourcing algorithms before them, today’s sourcing and search tools purport to threaten recruiters’ existence. And like history repeating itself, recruitment agencies are finding ways to create even more value with both technology and three parts of a professional recruiting service that cannot be emulated with technology. Sales Capabilities: The ability to talk a reluctant candidate into a job in a new region or state and/or in a company that has neither the time nor inclination to improve their internal culture or employer brand is an invaluable part of the successful recruitment agency makeup. However, many successful agencies will refuse to work with clients where the candidates have repeatedly left and severed ties with the company, the agency, the recruiter…or all three. Efficiency: While many agency recruiters work a “full” desk, they are highly motivated to close requisitions, since much of their financial remuneration comes from this specific milestone being reached quickly. Often for high level positions, where the cost of leaving the vacancy actually exceeds the salary of the person being brought in, companies will select an agency for this reason. Convenience: Many recruiting agencies offer a much simpler process to a talent acquisition VP or hiring manager than their internal counterparts. Successful agencies are aware that their intrinsic value lies in making the client’s job easier so they are less inclined to send through poor fit potentials and on average receive more information about the requirement due to a multitude of factors, the consultative nature of the relationship foremost among them. Each recruitment agency may specialize in recruiting candidates or staffing positions for a specific industry. Successful recruiting agencies know what sets their agency apart from others, and they’ve found what makes them unique in the recruiting industry. For example, Link Staffing Services mission statement dives deeper into their promise to the client and candidate. Successful recruiting agencies don’t just put words into a statement, they make a statement with their words. Recruitment agencies that get business year after year often have a distinct cultural fingerprint. However, this does not hold true on the enterprise level once the agency gets larger than a certain size, where high turnover, lower fees, unenforceable non-competes and other issues do not affect in and large art overall revenue. Agencies that clawed their way back from the recession (twice in some agency lifetimes ’99 and ’08 respectively) are quick to find the technology that will make their recruiters faster, better, and increasingly indispensable. They are innovative and up to date with current industry trends and job market. Many have created or are using full service back end systems that on average, are more agile and functional than many large company HRIS or ATS. The successful agency understands that mobile is a large part of the future of job search. Fully 30% of all Google searches, about 300 million per month, are employment related via Unbridled Talent. While only 27% of applicants expect to be able to apply to a job from their mobile device, 43% have used their mobile device to look for a job. (Source:Jobvite) For a successful agency recruitment team lead, this means that sites must be responsive and jobs must be simple to apply for from a mobile device. Fortunately, this is an area in which agencies have always excelled, understand that front-loading the application is the easiest way to follow up with a candidate. This stands in stark contrast to many laborious corporate job applications, and many candidates see it as a simpler way to get in the running for a desired job. Obviously, passive candidates feel strongly about not having to leap hurdles to get a job they never sought out in the first place. While the successful agency may not have every one of the aforementioned skills or characteristics, they will incorporate many of these into their practices. It’s difficult to forecast the future of recruitment agencies, although it would be a fair assessment to look to its marketing counterparts, advertising agencies, who despite the advent of marketing automation tools have continued to thrive, because of the service portion of their business model. Using this as a predictive model, it is safe to say that recruitment agencies will continue to thrive in the future. Thank you again to this month’s Leadership Sponsor, Linium Staffing. 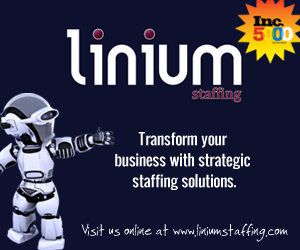 Please visit their site to understand how Linium can help your business with their strategic staffing solutions.